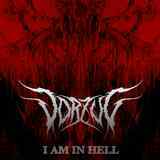 Americans Vorzug have been hard at work on their full-length debut, to come out soon, and for now they present the single I am in Hell to judge their progress. The band is billed as black metal, but listening to I am in Hell, the music is more like a confluence of several extreme genres. Of course one song cannot serve as complete ground to these pronouncements, but when I am in Hell begins, the tight defined riffs and bottom dredging vocals point in death metal direction. Using some pretty clean production, from there Vorzug pivots more towards higher pitch vocal delivery, nervy guitar playing some pretty cool melodic leads, so the overall experience reminded me of severeal Swedish blackened deaths teams. Vorzug ultimately concentrates on even parts melody and sounding grim, outright brutality never becoming a focus. A fun song to start your career with, Vorzug needs to deliver an album full of memorable songs to jump start their discography (trivial statement, which young band doesn't need that).